The simplest of dips but always a favorite at our get togethers. Mix together the cream cheese, sour cream, and taco seasoning until completely blended. Spread onto a flat dish. Spread a layer of guacamole over the dip mix. 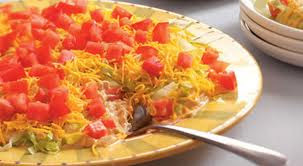 Top the mixture with lettuce, cheese, tomatoes, bell pepper and black olives. Serve with tortilla chips.